It's Potty Time! Practice your short game while you take care of business. 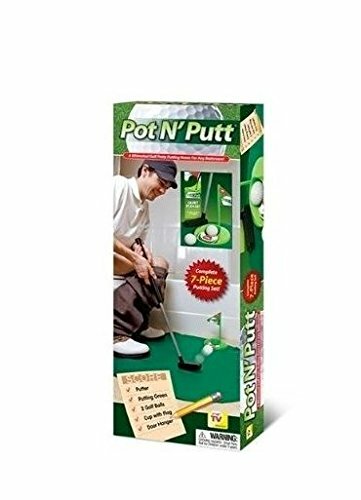 Pot N' Putt golf is an exciting new bathroom game that makes the perfect gift for any golf lover. Our complete 7 piece set includes all the accessories you need for some serious off course practice rounds. The 19th hold has never been this much fun. Door Hanger, reads "Pot N' Putt, Quiet Please, Practice Session in Progress"
If you have any questions about this product by Smart TV Solutions, contact us by completing and submitting the form below. If you are looking for a specif part number, please include it with your message.